Looking to step off road and into trail running? New to trail running and wanting advice? We asked inov-8 ambassadors to reveal their best tips for trail running beginners. The following tips are also useful for experienced trail runners who may be seeking renewed motivation. Don’t bite off more than you can chew. Not everyone is superhuman. Sure, we hear about folk who take up trail running and within six months have won a 100-miler. But for most of us it’s a case of building up slowly. Start with manageable runs and build on this. If you set your targets too high you simply set yourself up to fail. Or to get injured. A big part of trail/off-road running is exploration and adventure, and that’s at its best when following new trails. Throw caution to the wind and take the path less travelled, the one you’ve never been on before. Forget all about your pace or your mile splits, just relax and enjoy a micro-adventure. In less extreme environments, many of my happiest trail running days have started off this way. Draw on the wealth of knowledge of the local people and local runners within a running club. It’s a good way to find running partners and training buddies. You’ll find out the best trails to run on and routes to take. Delayed onset muscle soreness (DOMS) can be a bugger. It’s when your quads in particular, howl at you a day or two after a hilly trail run, you walk all funny and people laugh at you. That happens because your legs aren’t used to it and they get a bit of a shock. So just go easy on the downhills at first, or you might regret it. Wearing the right shoes is essential for trail running. During a trail run/ race, the terrain can change underfoot, so the most important thing is choosing a shoe that best matches that terrain and gives you the best grip. 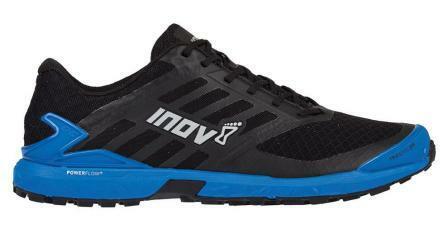 Forget road-specific shoes and get something with more traction on the outsole – the perfect shoe range for new trail runners is the INOV-8 PARKCLAW. It crosses over brilliantly from road to trail, as it still feels smooth like a road running shoe but has the necessary grip for paths and trails. When you become more adventurous with your trail running and start running regularly over muddy or technical trails, look at the INOV-8 ROCLITE range. Open your eyes and cast them out to the horizons. Out there somewhere is a trail or a hill and it’s calling your name. A path not yet travelled is eagerly anticipating your silent arrival. Maybe you’re a little bit scared or anxious. Fear of the unknown is only natural. These trails might seem outside your comfort zone – a whole world away from the predictable running track or your familiar roads. But still I urge you to embrace your fear and leave all that tedious running behind. The track and roads will still be there if you ever feel the need to return! I dare you to not become exhilarated by the endless trails reaching out in front of you. There’s a whole world to explore. Just step off the track, off that road. We weren’t born to just run in circles. Hop over the gate. Open your arms out wide. Find your wings. Fly. Your trails are waiting. Go. You won’t ever regret it. When I first began running on the trails, I wasn’t really sure where the local trails were! I bought a map of the local area and studied the network of trails near to my house. I almost had as much fun planning routes as I did actually running them. After a while it became a personal competition to see how many trails I could ‘collect’. Nowadays, I no longer need the map when I run from home… I’ve finally collected them all! Countless studies have shown the enormous health benefits – the biophilia effect – of being in green places. Tarmac or trees? Traffic or toadstools? It’s a no brainer. Sure, the path may look a bit muddy and rutted, but you’ll get core strength benefits from trails, whereas you’re more likely to get injuries from repetitive pounding of pavements. Tarmac is the harshest surface to run on and your body feels the shock, usually in the exact same way, time and time again. Find some good trail running races to get entered into. This will help to give you a focus for the year. If you aim to do more than just one ‘biggie’ it’ll also feel less stressful, i.e. you won’t be worrying that if you flunk your only race of the year, that it’s a wasted year. I’ll always have half a dozen ‘big races’ to focus on throughout the year. Ben Abdelnoor, Damian Hall, Ben Mounsey and Heidi Davies are all experienced off-road runners who have represented their countries in trail and/or mountain running races. They have worked hard to build their trail running skills and fitness over a number of years and in some cases decades. Shoes with aggressively studded outsoles that claw into soft and muddy ground, keeping the runner upright and providing confidence-boosting grip. Top pick: Mudclaw G 260. 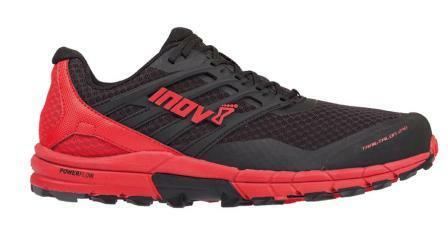 New to the inov-8 range for 2019, this shoe features fierce 8mm rubber studs made of inov-8’s revolutionary graphene-enhanced rubber. Graphene is the strongest material in the world and by infusing it into the rubber, it makes the outsole 50% harder wearing. Shoes with protection that will lessen the impact felt from sharp rocks and other debris found on the trails. This shoe’s rock plate and specially reinforced front bumper protect both the underfoot and the toes from sharp rocks. The 4mm studs are designed to cut through the loose top layer of trail debris and grip to the hard ground below. Shoes with cushioning are king or queen when it comes to running over paths and trails, particularly if the distances are big. This option not only provides excellent comfort underfoot and within the shoe itself but also has 4mm studs, each with a wide contact surface area, that allow for a smooth ride combined with outstanding grip.